Roman Republic. cast Aes Grave Uncia. ca. 225 to 215 BC. Denomination : Bronze uncia. Date : ca. 225 to 215 BC. Reference : Thurlow-Vecchi #56. Syd. 77. Cr 35/6. Sear 589. Size : 23.9 x 26.5 mm in diameter and 8.0 mm thick. Weight : 19.24 grams. Grade : good Fine, with a mid to dark green patina, but the patina is thick and slightly rough. Although I don't believe this coin should be cleaned any further, it might improve with professional cleaning. 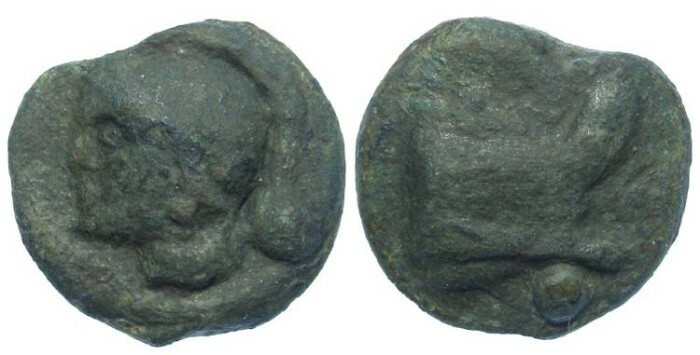 Obverse : Helmeted head of "MARS" left (see my comments below) with a large pellet behind.. Reverse : Ship's prow right, with a large pellet below. The obverse type is traditionally described as Roma, although I see no good reason for this beyond someone called it Roman a couple of centuries ago and no one ever took the time to look at this series closely enough to see why that is incorrect. On this specimen "Roma clearly has a pointed beard with fine pellets on it (clearer on the coin than on the image), which show this to be a male portrait, which is almost certainly Mars and not Roma. This coin is not alone in having these feature as Haeb. #22 and 23 in this series share some of these feature. Please note that I am not trying to say that there are two different types, one with Roma and one with Mars, but rather I believe there is only one type with Mars who is sometimes show clean shaven, and sometimes with a beard (either that, or there are two types and that is very un-likely).